Colleagues at Your Wedding: Must You Invite Them? Etiquette Flash: Should you invite your colleagues to your wedding? 2018 Update: We still stand by this advice on when to invite colleagues to your wedding — links have also been updated. Long story short, I just got engaged to another attorney at my mid-sized firm. We are both junior associates and we met as summer associates in 2007. Obviously, there are associates that we socialize with that we’d like to invite to the wedding. However, we’re not quite sure about whether to invite partners. Since we’re both quite new at the firm, we do work for lots of different attorneys. I’d hate to offend someone by not inviting him…especially in this economy! a) do you think you could make partner at this firm? b) can you afford to invite a lot of work colleagues to your wedding? c) how do you feel about mixing your wedding (and your grandparents and your college friends) (and any princess fantasies you’ll be indulging that day) with your work colleagues? Pictured: As of 2017, the pictured dress from Mikaella Bridal is no longer available. Check out some of these gorgeous strapless lace wedding dresses instead! Weddings are expensive, yo. On a price per plate basis, on a “size of venue” basis, on a “cost of invitations” basis, and so forth. If you invite 10 people from your office, with their dates that’s 20 people — this will translate into significant money for you as you plan your wedding. (And really, you have to invite at least enough work colleagues to seat them all at the same table or two.) Even if you give them the invite and hope that your partners don’t attend the wedding, you’ll still have to order more invitations and plan for a bigger venue. How do you feel about your “worlds” colliding? (We seem to recall a Seinfeld storyline here, but are too lazy to look it up…) There are a lot of different things to consider with a wedding. First, there’s the emotion of the day — some brides come down the aisle sobbing from joy, for example. If you think you’ll be extraordinarily emotional, you may not want to invite work colleagues. Next, you should consider the kind of wedding you’re having — is it the one that you’ve been dreaming about since you were 6? This is your wedding, so we fully encourage you to express yourself and make your dream come true — but you might also want to consider whether certain elements might make you seem more like a little girl in the eyes of the partners. (Big white gowns… an all-pink theme… etc.) (Even this author’s wedding dress, pictured, was not something we would have worn if we were inviting a lot of work colleagues — too romantic, too lacy, too much skin showing — but damn we loved that dress.) 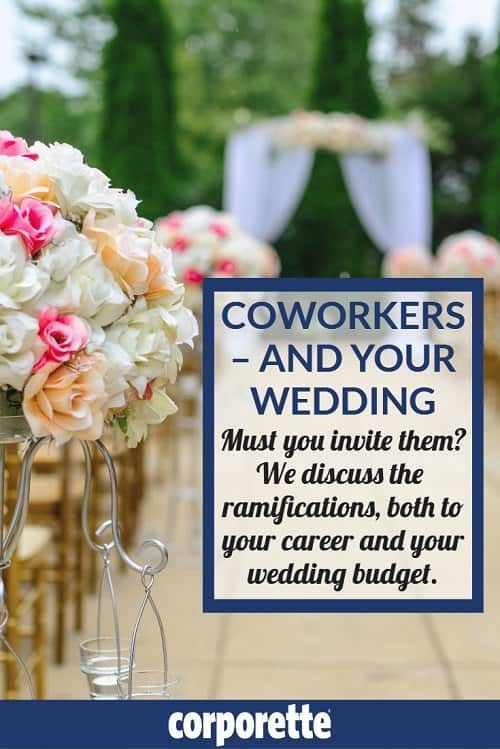 Like we said, this is your wedding, so do what you want — but don’t invite a work colleague to a wedding like that just so they feel included. Finally, you’ve already got a lot of different worlds colliding. It’s already going to be fun trying to keep your dotty grandmother who says racist things away from your well-educated friends. Throw in a frat brother friend or two shouting “Keep it in your pants!” to your husband during the first dance, and you’ll end up wishing you hadn’t invited work colleagues you don’t know very well, particularly ones with whom you’re already struggling for respect. These are all just are $.02, though — readers, what are your thoughts? If your wedding is not in the same area as your work, it wouldn’t hurt to make the gesture of inviting everyone (ie: being more inclusive), knowing that most non-close work colleagues won’t accept. Oh, and C, I love the dress…that was the first thing I thought when I saw this post. Honestly, I don’t think that work colleagues should be invited to your (outside of the office) bridal shower unless they are also close friends who you socialize with often outside of the office and office functions. Female SOs of invited work colleagues should DEFINITELY NOT be invited to your shower, unless you also know them outside of office functions and consider them good friends. According to proper etiquette, showers should be very small and intimate and every female invited to the wedding should NOT be invited to the shower. Period. Agreed. One of my coworkers invited all the women in the office to her daughter’s shower. None of us has ever even met her daughter. A little weird, IMO. I don’t agree. If you invite everyone, it’ll seem like you’re fishing for extra gifts since it’s customary to send a gift even if you do not attend. Hmmm, that is a good consideration, but IME colleagues tend to give a pooled office gift anyway. Guess it depends on your office’s usual practice. If they are good friends with the associates that they socialize with, I don’t see the harm in inviting them. And I agree with C re: the partners: if one or two act as mentors, then go for it. But I also agree with the above posters that to send out a glut of invites would only look like you’re fishing for gifts, which doesn’t look good. I guess the way I see it is if you would WANT to see the person outside the office, and they would be honestly happy to be there, then go ahead with the invite. For what it’s worth, I’m a partner at a law firm, and would not be at all offended not to be invited to the weddings of associates I work with, even ones I consider friends. I get that I am their boss, ultimately, and you don’t necessarily want your boss at your wedding because you don’t want the added pressure. I didn’t invite the Judge I clerked for, even though I adore her, for that reason. I’d love to come to the wedding if they wanted me there, but there’s no professional downside to not inviting me. Seconded. Also a partner, also am not expecting invites, even of people I mentor, or people who are up for partnership. I find it rather weird to get an invitation from someone I haven’t worked with much. And I had an associate invite us to their wedding and then quit two weeks later. THAT was awkward. Luckily we didn’t have invitation followed by layoff but that would be worse. Also consider the feelings of your fellow associates if you do invite one or more partners. They may feel substantially less at ease at your wedding knowing that the boss is there! FWIW, I just sent invitations for my own wedding. I invited quite a few associates at my firm (all of whom I socialize with outside of work) and no partners. I considered inviting one or two of my true mentors, but ultimately decided that I was more likely to offend by picking and choosing my “favorites” than by inviting no one at all. Someone advised me that your wedding invitation list should be your closest friends and family — not people that you ASPIRE to be close to. I think that it’s sound advice. Agree with this about being more likely to offend. Unless you’re only on one case with a very well defined set of partners that you do ALL your work for, the risk of offending others is high since in a law firm all the partners are your bosses. At the point that you have to engage in any kind of “Well, if I invite Partner X and Y but not B, will B be offended?” analysis, far better to not invite any. They all know how much $$ these things cost. This is a tough one – with so many different answers! I just went through this when I got married in May. In my situation I come from a small office – about 50 employees. And a coworker had gotten married 6 months before me and invited many people from the office. Although – she had been working there for 5 or 6 years, I had been working there for about 1.5 years at the time. I really struggled with this one – as I had a group of female coworkers who I socialized with during work – and occasionally at after-work happy hours. In the end, I chose to invite: The owner of the company (I knew him before I started working there), my direct supervisor, my ‘mentor’, and said group of girls – of course plus their spouses/fiancés, etc. One of the things that helped me make my decision was something my sister said, “Picture your wedding day – are you sad that these coworkers are not there? If so, then invite them. If you picture your wedding day and you don’t care if they are there are not – then invite only if you have room and it makes sense career-wise to do so.” That helped me – you spend at least 40+ hours a week with some of these people, you’re bound to want some of them to be there for your big day! All really interesting considerations, C. I decided to go another route. My law firm already gets more of me than I’m comfortable with. I try very hard to maintain a social life outside of work, but the time committment and the constant exhaustion make it hard for me. My wedding (this June) is about having a day when I can gather the people I love together and enjoy them without a lot of fuss getting in the way. I just don’t want to involve office politics or concerns about my standing in the firm. So the only people I’m inviting are those with whom I have a personal friendship, whether they happen to be colleagues or not (meaning 2 associates will be invited). I like that there’s a part of my life that The Firm can’t touch (even though that part seems to get smaller each year). oh yes — that was pretty much my attitude too — i didn’t invite anyone from work who wasn’t a best friend. but then, that was sort of my approach to my wedding overall — we only had 55 people total in attendance; pretty much just family and friends who would have been in the wedding party had we had a big one. it also helped that i had it from the small midwestern town where i’m from. I got married last year and invited the entire law firm–all 4 partners, 4 staff people, and 2 other associates, as well as officials of our main client (the municipality). But it’s a small firm and a small town, and the price per head was pretty modest (simple wedding). In a family-oriented small firm, it just made sense. So much depends on location, formality, and size that this question is basically impossible to answer without more information. -You don’t have to invite everyone with a +1 (obviously you have to include spouses/partners/live-in-boy/girlfriends). Weddings are social events where guests should be comfortable making new friends/connections. -You don’t have to seat people at tables that are only work people. If you are assigning seating it is, in fact, a lovely way to get people to make new connections–as long as there are a couple other people at the table they know, then feel free to mix it up (just don’t leave anyone all alone, of course!). If you aren’t assigning seats, then people will naturally only sit with the people they know and that consideration doesn’t matter anyway. -Invite the associates you are friends with and any partners that are true mentors. Don’t worry about it beyond that, don’t talk about it at length. -invite anyone who will be offended if they don’t get invited. Good point about not having to seat all work people at the same table. I had two groups of work people (my work friends and my husband’s work friends- many of whom are personal friends of both of us). We took the dinner party approach to seating. Instead of just seating all these work people together, this family together, etc – we sat guests at tables where they knew at least one other person – but also matched personalities and things in common. So one table had a couple of my college friends and a couple of husband’s work friends – because they had a lot in common – all the people at the table already had kids, had similar personalities, etc. And vice versa, we sat other coworkers with our personal friends – all single or in casual relationship, kind of in the same life-stage, and tried to mix in shy people with others who are good at getting people involved in the conversation, etc. It was actually more fun that way putting together the seating chart! I knew some of my former coworkers wouldn’t want to sit at a ‘work table’ as they see those folks enough already! Great idea. In many cases certain groups are not large enough to fill a whole table, so you often have a few people at each of those tables who are left out. I recently went to one wedding where I didn’t know anyone except a guy I had a bad date with ~8 years prior and never spoke to again. Of course I ended up seated at his table with him and his HS friends and it was so awkward. I do have to say I HATE singles tables though and have no desire to end up at one because I’ve decided not to bring a date. I think it’s a mistake to assume that just because people have kids or are married, they necessarily have something in common with the other people at the table. Most colleague’s wedding to which I have gone/been invited have been people at a similar level to mine and with whom I have a significant out-of-work relationship. I don’t think most people are offended if they are not invited to a junior colleague’s weddings for exactly the reasons described above – they understand that the wedding is supposed to be fun, relaxing times and not the time to be worried about the impression you are making on your boss. No matter how many or how few people in your office you are inviting, I wouldn’t talk about it too much at work. 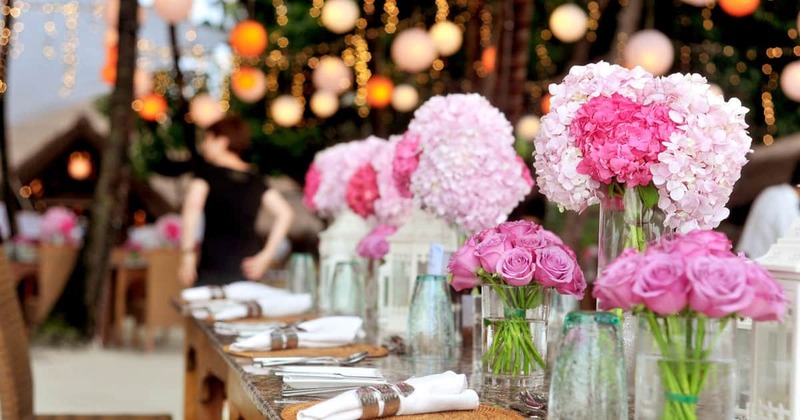 We’ve all had that annoying wedding-obsessed colleague who feels the need to fill us in with every minute detail of her seating arrangement/ centerpiece/ bridesmaid /tuxedo/church decoratoins/dj/ drama….don’t be that girl. Please. A wedding is a family-and-friends celebration of the marriage, not a networking opportunity. When in doubt about inviting a co-worker, don’t. Also consider: maybe the senior staff at your work don’t want to go to your wedding? Maybe they will just see it as a bid for presents. (They’ve been around a long time, and are perhaps a bit cynical, having seen all the divorces, too). My thanks to those commenting here for not using the word “invite” when they mean “invitation”. “Invite” is a verb, “invitation” is a noun. I’m sorry for the snotty tone of this comment, but really, all this frump/gran stuff is getting to me a bit. Mi scusi. I’m actually getting married this Saturday – and while I don’t work in a law setting – I do work in government/research capacity. I ended up inviting my immediate boss, who is very much a mentor, and a fellow researcher who is a friend from grad school as well. No one in my office expected to be invited – they did however, all pool together for a gift and threw me a surprise bridal shower. Everyone has also been very excited for me in terms of the wedding/honeymoon/taking time off – and has helped to make sure that all deadlines are met etc. before I leave tmrw (yes!). As others have said, I would just remind you not to bring it up unless someone else does (and not be that girl always going on about the wedding) and to make sure that it is obvs to everyone that your work commitments are more important to you, i.e. checking with others that they don’t need anything from you while you’re away. Hmmm….even we old – and supposedly dotty – women sometimes peek at these blogs. I hope your grandmother is not one of them. Or that she has an absolutely fantastic sense of humor. As we are now so will you be…. I disagree with the comment that you don’t need to invite “+1″s for each guest. Although your guests may choose not to bring a date, I think you need to give them that option. Yeah, nothing worse than being the third (or fifth or seventh) wheel at a wedding where everyone else you know, if you know anyone at all, has their spouse or fiance or whatnot with them. Yes. Please don’t invite people to go stag, especially to a wedding, where it’s all about love and romance. Too many brides and grooms out there not considering the needs and desires of their guests, who have given up their day to attend, possibly traveled a considerable distance, bought a gift, and, if female, perhaps also an outfit. Best wedding and reception I ever went to was the one where the bridal couple made a point of visiting, together, every person attending, thanking them and making sure they were having a nice time. Bridesmaids and groomsmen kept an eye out to find congenial conversational partners for those seeming to need them. Very classy. While I understand the point of this comment, I just think it’s wrong. If you have multiple guests who are single and who at least know a couple other people (i.e. no one will be all by themselves), it is absolutely okay to invite without a plus-one. Weddings are expensive and who wants a bunch of random people who are there just as plus-ones? There are plenty of ways to try to make guests comfortable without letting them bring some person who probably doesn’t even know the bride and groom, and isn’t even in a relationship with the guest… I’ve been to weddings where I was given a plus-one but was single at the time, and I didn’t think it was appropriate to just ask a friend to fill in as a fake date (and force my friends who were planning a wedding to pay for another meal for a stranger). That said, I very much agree with your entire second paragraph. That is hugely important. I totally agree with this – when I was single, anon + guest put a LOT of pressure on me to find a suitable date, so I just went stag. And why should the bridal party pay for a date night? If it’s not a serious relationship, no need for a +1 invite. Definitely I agree with this. There have been some weddings that are my dad’s extended family so he gets invited but the rest of us don’t, which is absolutely fine. Or when his ex PA got married (who he had a very collegial relationship with and now worked with him rather than for him) he went but not my mum, because he was there as work dad not family dad. I think as long as there will be someone for someone going alone to talk to, it’s fine – and if you’re going to go no +1s it has to be for lots of people not just a few. C’s scenarios about drunken frat boys/worlds colliding is not just theoretical. A couple of our friends got really drunk and out of control at our wedding. One guy hopped on the parked mobility scooter of an older lady from my church and rode it around outside where we couldn’t see him, whoopin’ and hollerin’. We didn’t hear about it until days later. It was a bad scene and he is no longer really a friend. We had no idea that he became that kind of a drunk, and while we had no significant coworkers there, it was embarrassing. The reception was black tie, which does not guarantee folks will be on their best behavior. Fortunately, my church friend had a sense of humor about it, having been a bit of a hellion in her younger days. I’m sure you cringe thinking about it, but I have to say that this is a hilarious story (for those of us who can pretend it was just a movie). Yeah, I don’t cringe too much anymore. Let’s face it, the best stories tend to be horror stories! Very good points about reasons not to invite senior staff from your work: I was at a wedding once where, at the reception, the groom stepped on the train of the bride’s dress. She SHRIEKED at him at the top of her voice, and used bad words. The whole room turned and looked. Not a good image for your bosses to have in their heads. What if you work with a small group (5 attorneys, 3 staff) at a large firm, but don’t socialize with them outside work? The rule of thumb I was told before my wedding was to think of who you would be comfortable hugging on your wedding day. Inevitably, you will talk to everyone (or almost everyone) at your reception who will offer their congratulations. Unless you catch them sitting (and they don’t stand up to congratulate you) it’s probably going to be a lot of hugs for the bride and handshakes for the groom. Do you really want to hug the crazy senior associate down the hall? Me either. I stuck to work friends only (i.e. people I work with that I feel comfortable getting drunk with). My husband’s a partner in a law firm, and we’re totally fine with not being invited to weddings. (It’s happened, and may happen soon.) We have busy lives, and would rather spend time with our kids than attend a wedding that we’re barely being invited to. That said, if my husband’s invited, I think he’d want me to be invited too. I think he’d appreciate always having someone to talk to, and it undermines the celebration of marriage not to invite someone’s spouse. Yes, male partners will be upset if they are not invited just as much as female partners. My fiance’s business partner (and ex girlfriend) of almost 10 years and I do not care for each other (to put it lightly). They have joined with some investors to grow their company, and now have minority ownership. They do still own a business together (their flagship store) but want to dissolve their assets and he and I want to start a life together. Our wedding is planned for a year away (we’ve already been engaged 1 year). My question: do I have to invite her? we have had multiple arguments about their business/personal relationship, and he continually argues that it’s JUST BUSINESS. Since those are his words, can I use that as my argument that business doesn’t need to be at our wedding? sorry to post my question in someone else’s area. I do not know how to start my own question area. If this needs to be removed, I will totally understand. I have read everyone else’s posts/comments/advice. I love that all the ladies here are professional and honest with their words. Thanks- I feel a bit better holding my own when the discussion arrives, but would LOVE some specific feedback… thanks!